On-air challenge: For each word, think of a synonym whose first and second letters, in order, are the second and third letters, respectively, of the given word. For example: Shock --> horrify. Last week's challenge: Name a famous actor — first and last names. Drop the first two letters of the first name and the last two letters of the last name. Then put a "Y" between what's left of the two names. The result, reading from left to right, will identify who might solve this challenge and play puzzle on the air with me next week. A Puzzle That'll Have You Floored In Florida — And Across The U.S.
On-air challenge: Every answer this week is the name of a state. For all the words given, ignore the vowels in them. The consonants in them are the same consonants, in the same order, as in the states. For example, the word "regain" would be "Oregon." Last week's challenge from listener Martin Eiger: Name part of a car. Drop the fifth letter. Now reverse the order of the last three letters. The result, reading from left to right, will name a major American city. What city is it? 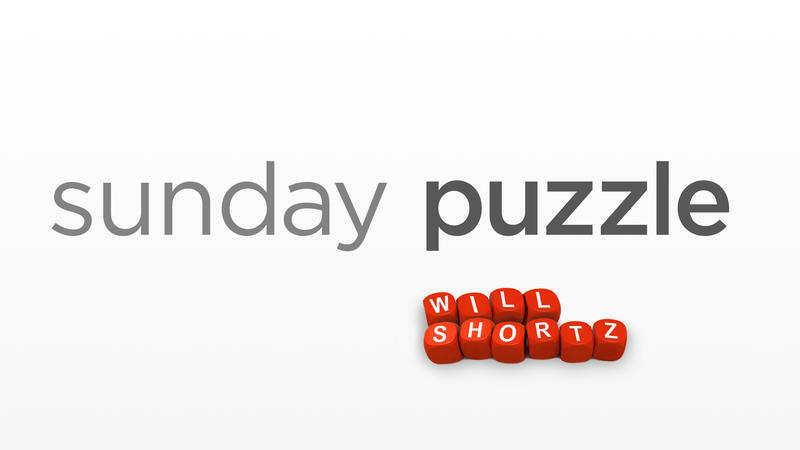 On-air challenge: Today's puzzle has a bit of wordplay. Change one letter in each word provided to make two new words. The letter you change must be in the same position in each word of the pair. And the letter you change each of them to will be the same letter of the alphabet. For example, "relief" and "mallet" become "belief" and "ballet." A Puzzle With A Northern Focus, Eh? The name of which Canadian province is an anagram of "oration"? Last week's challenge: The seven words in the following sentence have something very unusual in common — something that almost no other words in the English language share. What is it? "Ira saw three emigrants restock large wands." On-air challenge: In each pair of clues, the answer to the first clue is a word that contains the consecutive letters A-R. Drop the A-R, and the remaining letters in order will form a word that answers the second clue. On-air challenge: Because tomorrow is June 1st, today's game is one of categories, based on the word "first." For each category, name something in it starting with each of the letters F-I-R-S-T. For example, if the category were "Two-Syllable Boys' Names," you might say Francis, Isaac, Richard, Simon and Tony. On-air challenge: Every answer is the name of a well-known U.S. city. For every word given, ignore the vowels. The word's consonants are the same consonants appearing in the same order as those in the city's name. For example, given the word "amiable," the answer is "Mobile" (Alabama). Last week's challenge Think of a common two-word phrase for something you might see in a kitchen. Reverse the words — that is, put the second word in front of the first — and you'll name a food, in one word, that you might prepare in a kitchen. What is it? On-air challenge: Each word provided is an anagram of something you might see in a kitchen. For example, "skin" is an anagram of "sink." Last week's challenge: This challenge comes from listener Peter Stein of San Francisco. Think of a job, in eight letters, that names someone who might work with actors. Change one letter in this to the following letter of the alphabet to name another person who works with actors. What jobs are these?